Beautifully engraved certificate from the California Computer Products issued in 1971. This historic document was printed by Jeffries Bank Note Company and has an ornate border around it with a vignette of a world globe with CalComp in front. This item has the printed signatures of the Company's President and Secretary and is over 45 years old. California Computer Products, Inc. (CalComp) was a manufacturer of digital plotters, disk drives and other "plug compatible" computer equipment. CalComp was incorporated Sept. 17, 1958, and introduced the world's first drum plotter (the Model 565) in 1959. They were involved primarily with the production plotters until about 1968, when they began selling disk drives manufactured by Century Data Systems of Anaheim, California. The legendary CalComp 1040-series pen plotter was introduced in 1984. For a while, CalComp distributed IsiCAD software, now owned by FIT Systems. 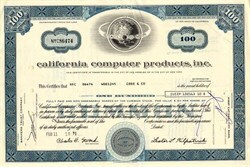 CalComp was bought by Sanders Associates in 1980. In 1986, CalComp became a unit of Lockheed after the company purchased Sanders Associates.